What defines mental illness? If we said it was a state of lack of mental wellness, do we mean a mentality that makes behavior inoperable, or self-destructive and destructive of an external environment to include others? What is a mentality which is deviant yet not harmful? Does a mental illness simply refer to abnormal behavior, or a true physiological malady? It’s easier now than ever to refer to mental illness from an empirical vantage point, of a brute fact anatomical morbidity in the brain. Yet in the early sixties, it was to some extent still more alchemy than a science. The whims of medically trained professionals could sentence a person to a lifetime of medical watch, of utterly debilitating the individual from living a full human life. This would ostensibly be for the benefit of society, to ostracize the quote “sick”. Yet what is a sign of a healthy society but a tolerance of individual mentalities? 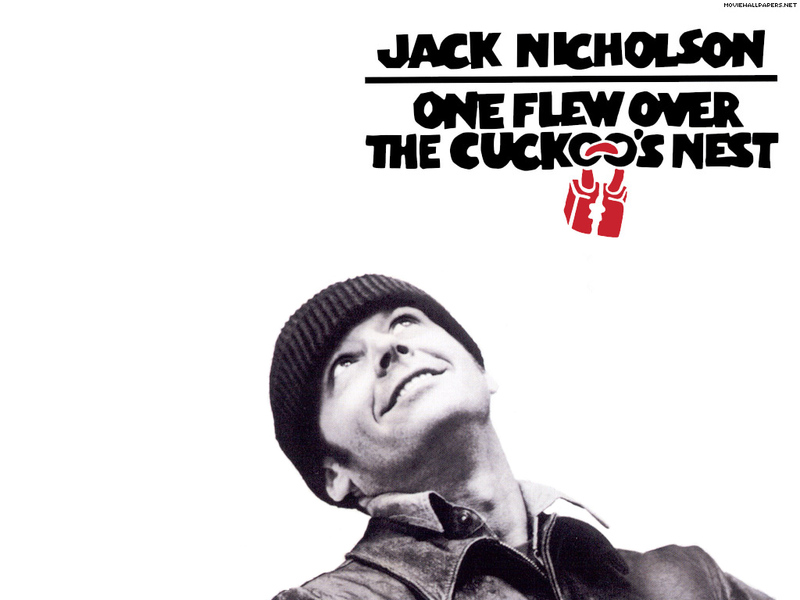 Certainly One Flew Over the Cuckoo’s Nest does not depict an assembly of mental ward patients in a suggestive Orwellian displacement. Many are indeed incapable of self-sufficiency, of creative agency which makes them functional and cooperative with others, and thereby productive. However, the main supporting cast of voluntary admissions is filled with those who are being whipsawed about by the daily struggle of existing yet do not know how to cope. Would such mentalities perish in a previous age, or would they even exist when the sole focus of their waking day was in a furious concentration to upkeep and subsistence? An extreme amount of leisure time, as wanted by all to be able to pursue the heart’s delight, can be poisonous if unprepared. We can see such mentalities, especially by R.P. McMurphy the protagonist, as not physically morbid, but behaviorally ill; of handling the everyday occurrences of disturbances to the psyche, something so commonplace that the ability to adapt to it is taken for granted by the sane, improperly. Medication only helps to combat symptoms of the problem. McMurphy himself has severe issues with the natural constraints a society has; of the limits on one’s own behavior and personal freedom for the sake of plenitude that being in harmony with others provides. He does not or simply cannot see the merit in following the rules. He sees things in complete black and white with no meditation on the long-run consequences to any of his actions. The difference between such a fellow and any ordinary juvenile is the juvenile has a degree of fear instilled in him, which makes him pause before impetuously revolting against the soft boundary conditions society imposes upon him. McMurphy never shows a care or even recognition of such boundaries. He simply acts as how he deems virtuous. His virtuosity, or rather his courage, is admired by the voluntarily committed, who wish they could handle the concourse of life as much as he. They wish they could live without giving a damn. But for one reason or another, they have had to withdraw from the everyday, including its strife; but they by no means are finding resolution in the psychiatric ward. For what would constitute progress among these men? It is extremely nebulous what exactly are their illnesses, other than what was described before: a degree of idleness which creates discomfort which is unrelenting and expressed in a variegated manner as a reflection of their personalities. We could see that the true outcome of the mental ward is to try and conform all individuals to behaving cooperatively, even if submissively, to the social norm. The pangs that may arise from trying to be an individual, however cognizant a man is that he is truly separate from the herd, are too onerous a burden to be resolved. Perhaps one day behavioral outcomes can be directed toward handling anxiety properly, rather than shocking and lobotomizing to render individuals artificially content; genuine human flourishing, therefore, does not necessitate debilitating man to arrive at peace.